How do you plan to “Go Viral in 2009”? Is viral marketing even in your online marketing vocabulary? What are the keys to success in a viral marketing campaign? Who are you routing for in the BCS Title Game: Florida or Oklahoma? Oklahoma sophomore cornerback Dominique Franks said during interviews with the media Sunday morning at the Harbor Beach Marriott Resort & Spa that Tebow would have been no better than the fourth-best quarterback in the Big 12 this season. Oklahoma’s Dominique Franks said stepping up to the task this season of defending Big 12 quarterbacks was no easy chore. ‘If you look at the three best quarterbacks in the country, they came from the Big 12,’ said Franks, referring to Oklahoma’s Sam Bradford, Texas’ Colt McCoy and Texas Tech’s Graham Harrell. Franks didn’t stop there, either. He said the Heisman voters got it right this year in selecting Bradford for the coveted award, no doubt spicing up the prelude to Thursday’s FedEx BCS National Championship Game. Wow, think this will spark some controversy and emotion in the BCS Title game? How do you think Florida will respond to this? Viral Marketing is such a HUGE part of starting an online business. If you can get “buzz” out to your audience, a start-up website can get immediate traffic and start-up success! So, what’s the key to a good viral marketing campaign? Load it up – this is the part where you make your viral piece connect with your customer on an emotional level. Touch their heart, or touch their funny bone, or something else that makes them think…I need to share this. My thoughts: I think this point is EXACTLY what the above statement by the Oklahoma defensive player does by sharing his thoughts about Tim Tebow – he sparks emotion that could really come back to haunt he and his team. Controversy, humor, breaking news: these are Keys to Success with Viral Marketing! Don’t advertise – viral marketing is about sharing something that is funny, or is a great story. Don’t just think about advertising through your piece. Many of the best viral ads don’t even include a brand name or anything…it’s left to the customer to figure it out. My thoughts: Your creativity WON’T GO VIRAL if you’re blatantly advertising your company. Would you pass on a recommendation to a used car salesman or a network marketing “friend” who, whenever they talk to you, it’s about their “break-through product”? In the above example, there’s definitely NO ADVERTISING although the buzz these comments will create will probably help sell more tickets and get more viewers, even from people who don’t really care about college football. Spread the message – do everything you can to share the message online and offline. Post to forums, message boards, social accounts, blogs, emails, etc. Basically get the viral aspect started. My thoughts: Don’t be afraid to ask for help from connections you’ve formed through online social networks. Some of my best “viral marketing” has been through the effective use of StumbleUpon and using Facebook Pages. The funny thing is, whether Oklahoma wants it or not, this message will get passed all over the Florida Gator Nation and sparks will be flying. If it were your team being criticized, wouldn’t you want this stuff to be heard to help fire things up? Love the comments – reply to comments made on your piece. Don’t delete negative comments unless they are crude or attacking to others. My thoughts: This was one of the best things I learned from Gary Vaynerchuk at Blog World Expo 2008: “Reply to all comments on your blog, respond to all your emails, and connect with your readers/clients.” When setting blogging goals as part of your marketing strategy, make sure viral marketing and connection is included. Your success in starting an online business will come a lot quicker this way. It will be interesting to see how many “comments” will come from these ideas. If it’s on ESPN, who ISN’T hearing about it in the sports industry? 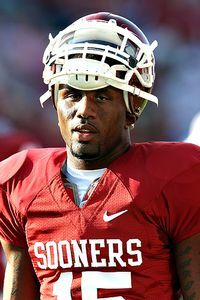 How would you respond to the claims of the Oklahoma defensive back? Do you think his statements will go “Viral”? What funny, controversial, or unique ideas can you find in your industry that have “viral capabilities”? Great post here Nate. Although I have learned better to go back and forth with you on sports – I will comment about companies needing to go viral in 2009. I really think with all the debate about link buying and Google keeping a closer watch etc. it is going to be even more so important to create something that will get people talking and linking. It will require even better SEO to rank for the words that you want, but it will be made easier by how “social” and “viral” your content is. I mentioned you in my latest video! It’s an appearance I did on the news last week. It’s received a handful of views…I’m hoping it will go viral soon…maybe we’ll both see some traffic from it!